Callum Hudson-Odoi has revealed even Eden Hazard’s team-mates were stunned by the Belgian’s wonder goal against West Ham. The 18-year-old admitted he watched on in awe as Hazard slalomed past five Hammers defenders before slotting home at Stamford Bridge on Monday. Hazard matched his best-ever single season tally of 19 goals in all competitions for Chelsea on Monday, notching twice in the Blues’ 2-0 Premier League victory. And Hudson-Odoi conceded Real Madrid target Hazard is so good that sometimes even his colleagues have to stand back and watch. “All I can say is that I watched the whole thing with my mouth wide open,” said Hudson-Odoi. “He’s an exceptional player, though, and I do expect things like that from him. “I just watch and learn from him in training, and then in games. Chelsea moved third in the table with Monday’s West Ham victory, edging ahead of London and Champions League qualification rivals Tottenham and Arsenal. 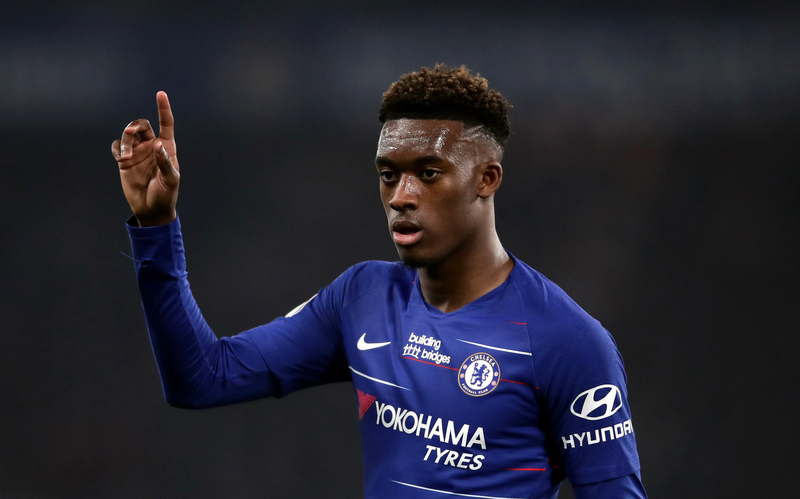 Spurs and the Gunners have a game in hand over the Blues however, leaving Hudson-Odoi acutely aware of the importance of Monday’s win. “The three points were absolutely crucial,” the England international told Chelsea TV. “A couple of other teams dropped points so we needed to get the result, and we did and we did it in the right manner as well. “Our mentality was strong, we worked hard throughout the game, and we had to stay patient because they stayed very compact. Hazard’s spectacular performance against West Ham will only have boosted Real Madrid’s resolve to prise the 28-year-old away from Stamford Bridge. The Belgium star’s Chelsea contract expires next summer and head coach Maurizio Sarri has said the Blues must respect Hazard’s decision on which club he will represent next season. Hazard himself remains adamant he will delay that decision until the end of the campaign, while he also moved to downplay the significance of personal milestones. The live-wire forward could hit 20 goals in a single season for the first time for Chelsea, but rejected the significance. “My target is not to score goals, I just want to win games,” said Hazard. Hazard has made no secret of enjoying his partnership with France striker Olivier Giroud at Chelsea, but also revealed he and loan signing Gonzalo Higuain are also beginning to click. “We’re starting to understand each other,” said Hazard. “It’s not easy, he’s only playing here two or three months. He’s a great player. “He’s involved in the game, he can come deep, go forward. Manuel Pellegrini admitted West Ham paid the price for a lacklustre first half showing in west London. “If we lose by playing the way we played in the second-half for the whole game, we have no complaints,” said Pellegrini.